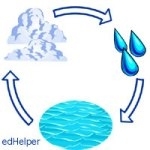 1 You know that the water cycle is an ongoing process. Water evaporates. It condenses. It falls to earth as precipitation. But what happens when it reaches the earth? 2 During the spring thaw or after a rainstorm, puddles form on the ground. But they are soon gone. What happens to this surface water? It can move several ways. 3 First, it can seep into the ground. Think of a sponge. The holes in the sponge soak up the water. If there are large enough holes in the soil, the water will soak into the ground. It will help the plants grow. Or it may become groundwater. Groundwater is water below the earth's surface. People who have wells depend on groundwater to keep them filled. 4 If a sponge is already filled with water, no more will sink in. The same is true of the soil. If the soil is already soaked, the water will stay on the surface. In the same way, if the soil doesn't have large pores, the water will not seep into it. If the water stays on the surface, one of two things can happen.